I measured the Arcam FMJ SR250 with my Audio Precision SYS2722 system (see the January 2008 "As We See It"). Before performing any tests, I ran it at 40Wpc into 8 ohms for an hour. At the end of that time, the louvers on the top panel were warm, at 110.6°F (43.7°C). 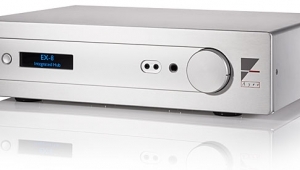 Looking first at the Arcam as a conventional integrated amplifier, I performed all the measurements in Stereo Direct mode, which bypasses the digitization and DSP effects. 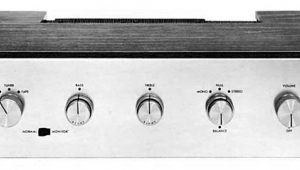 With the volume control set to "99," the maximum gain at the loudspeaker terminals was 43.8dB. 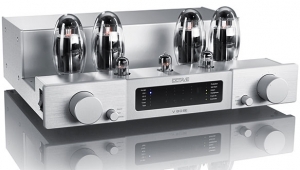 At the headphone outputs, the maximum gain was 26.2dB; at the preamplifier outputs it was 13.1dB. 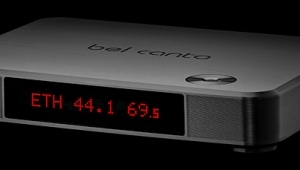 The unity-gain setting of the volume control would have been between "48" and "49": with the volume control set to the former, the gain was 0.6dB; with the latter, it was +0.4dB. All outputs preserved absolute polarity (ie, were non-inverting). The input impedance at low and middle frequencies was usefully high, at 90k ohms. Though the impedance dropped to 53k ohms at the top of the audioband, this is still sufficiently high not to load down source components. 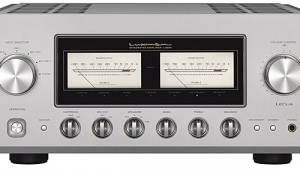 The output impedance at the preamplifier outputs was a moderate 620 ohms, but examined at the headphone outputs, the impedance was 100 ohms, which is too high to be optimal for many low-impedance headphones. The output impedance at the speaker outputs was 0.11 ohm at 20Hz and 1kHz, rising inconsequentially to 0.13 ohm at 20kHz. As a result, the modification of the amplifier's frequency response with our standard simulated loudspeaker remained within ±0.1dB limits (fig.1, gray trace). This graph also reveals that the Arcam has a wide bandwidth, its response not reaching 3dB until 150kHz or so. The SR250's reproduction of a 10kHz squarewave thus has short risetimes (fig.2), though this graph shows the slightest hint of overshoot. Figs. 1 and 2 were taken with the volume control set to "99." The wide bandwidth at the speaker terminals was preserved at lower volume-control settings, as was the excellent channel balance. However, the headphone output was down by 0.5dB at 20kHz, and by 3dB at 59kHz. Fig.1 Arcam SR250, frequency response at 2.83V into: simulated loudspeaker load (gray), 8 ohms (left channel blue, right red), 4 ohms (left cyan, right magenta), 2 ohms (green) (0.5dB/vertical div.). Fig.2 Arcam SR250, small-signal, 10kHz squarewave into 8 ohms. Channel separation (not shown) was good, at >80dB across the audioband. The unweighted, wideband signal/noise ratio, measured with the inputs shorted but the volume control set to "99," was okay, at 69.3dB in both channels ref. 1W into 8 ohms, improving to 77dB when the measurement was restricted to the audioband, and to 79.9dB when A-weighted. The primary source of noise appeared to be spuriae at the 60Hz AC mains frequency and its odd-order harmonics (fig.3). Fig.3 Arcam SR250, spectrum of 1kHz sinewave, DC1kHz, at 1W into 8 ohms (linear frequency scale). 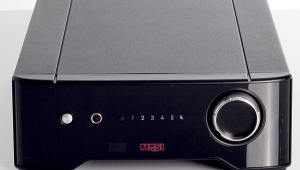 The Arcam's maximum output power is specified as 90Wpc (19.5dBW) with both channels driven, 20Hz20kHz, at <0.02% THD; and 125Wpc (21dBW), both channels driven, at 0.2% THD. Figs. 4 and 5 show how the percentage of THD+noise respectively varied with output powers into 8 and 4 ohms. At 1% THD+N, our usual definition of clipping, the SR250 exceeded the specifications, delivering 165Wpc into 8 ohms (22dBW) and 250Wpc into 4 ohms (21dBW). The downward slope of the trace in fig.4 indicates that actual distortion lies below the noise floor; the broken curve in fig.5 suggests that it reveals the effect of the class-G voltage-rail switching. I don't know why this wasn't apparent in the 8 ohm graph. 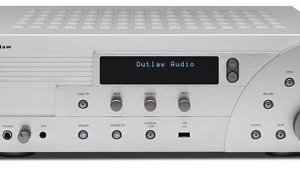 Fig.4 Arcam SR250, distortion (%) vs 1kHz continuous output power into 8 ohms. 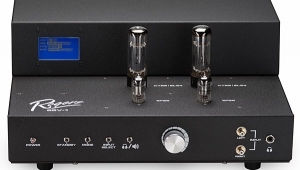 Fig.5 Arcam SR250, distortion (%) vs 1kHz continuous output power into 4 ohms. 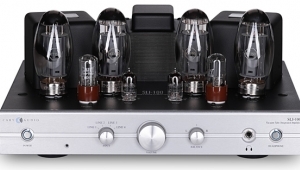 Measured at a relatively high level, 24.4V, which is equivalent to 74.5W into 8 ohms and 149W into 4 ohms, the Arcam's THD+N remained below 0.004% into 8 ohms at all audio frequencies, and below 0.008% up to 3kHz into 4 ohms (fig.6). Above 3kHz it rose slightly into 4 ohms, to 0.03% at 20kHz. The distortion is predominantly the third harmonic (fig.7), which was slightly higher in the left channel (fig.8, blue trace), but still low in absolute terms. Intermodulation distortion was also very low (fig.9). Fig.6 Arcam SR250, THD+N (%) vs frequency at 2.83V into: 8 ohms (left channel blue, right red), 4 ohms (left cyan, right magenta). Fig.7 Arcam SR250, 1kHz waveform at 50W into 4 ohms, 0.0033% THD+N (top); distortion and noise waveform with fundamental notched out (bottom, not to scale). Fig.8 Arcam SR250, spectrum of 50Hz sinewave, DC1kHz, at 120W into 4 ohms (linear frequency scale). Fig.9 Arcam SR250, HF intermodulation spectrum, DC24kHz, 19+20kHz at 60W peak into 8 ohms (linear frequency scale). 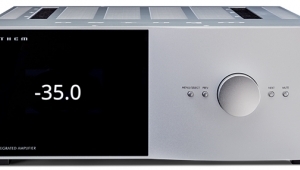 To test the Arcam's digital inputs, I used not only the Audio Precision's digital outputs but also WAV test-tone files sourced from a USB stick plugged into the SR250's rear panel. Via this USB port, the Arcam accepted 16- and 24-bit WAV files sampled at 44.1 and 48kHz, but displayed a message of "Unsupported File Type" with AIFF files and all files sampled at rates higher than 48kHz. I didn't test the SR250 with Ethernet data. 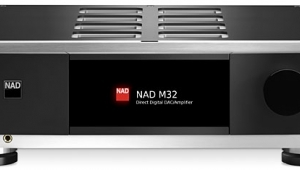 With the volume control set to "99," digital data representing a 1kHz tone at 20dBFS produced an output level at the speaker terminals of 32.5dB, which is just below clipping. 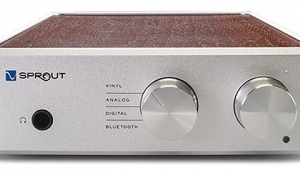 Therefore, the digital inputs need to be used with the volume control set no higher than "69." All digital inputs preserved absolute polarity. Fig.10, taken with 44.1kHz-sampled USB data, reveals that the Arcam's digital reconstruction filter is a conventional FIR type. However, when I analyzed the Arcam's output with 24-bit data sampled at 44.1kHz representing white noise at 4dBFS (footnote 1), the resultant spectrum (fig.11, red and magenta traces) mostly rolls off above half the sample rate (vertical green line), with a rise in ultrasonic noise above 50kHz. With a full-scale tone at 19.1kHz, again sourced from 24-bit/44.1kHz WAV data on a USB stick, the spectrum (fig.11, blue and cyan traces) was "dirty," with many sidebands surrounding not only the 19.1kHz tone but also its harmonics. This graph was taken with the SR250 in Digital Stereo mode; checking the settings with the onscreen display and using the front-panel buttons rather than the annoying remote, it appears that input data are sample-rate-converted to 48 or 96kHz before being fed to the DSP circuitry. I had the Arcam set to 96kHz conversion for the testing, and it wasn't possible to select Stereo Direct for USB-sourced data. 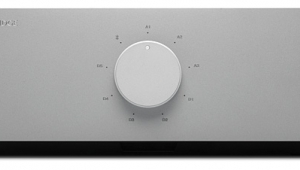 Fig.10 Arcam SR250, USB data, impulse response (one sample at 0dBFS, 44.1kHz sampling, 4ms time window). Fig.11 Arcam SR250, USB data, wideband spectrum of white noise at 4dBFS (left channel red, right magenta) and 19.1kHz tone at 0dBFS (left blue, right cyan), with data sampled at 44.1kHz (20dB/vertical div.). Tested with S/PDIF data, the SR250's frequency response with data sampled at 44.1, 96, and 192kHz data (fig.12) showed the expected sharp rolloff below half of each of the two lower sample rates, the rolloff continuing with 192kHz data to reach 6dB at 65kHz. 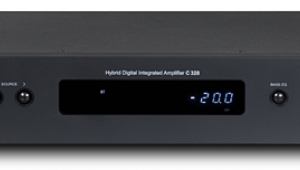 Again tested with S/PDIF data, the increase in bit depth from 16 to 24 with a dithered tone at 90dBFS dropped the noise floor by almost 12dB (fig.13), implying that the Arcam's S/PDIF digital inputs offer around 18 bits of resolution. However, with data sourced from a USB stick, the tone at 90dBFS was missing (fig.14), suggesting lower resolution. Fig.12 Arcam SR250, S/PDIF data, frequency response at 12dBFS into 100k ohms with data sampled at: 44.1kHz (left channel green, right gray), 96kHz (left cyan, right magenta), 192kHz (left blue, right red) (1dB/vertical div.). Fig.13 Arcam SR250, 44.1kHz S/PDIF data, spectrum with noise and spuriae of dithered 1kHz tone at 90dBFS with: 16-bit data (left channel cyan, right magenta), 24-bit data (left blue, right red) (20dB/vertical div.). Fig.14 Arcam SR250, 44.1kHz USB data, spectrum with noise and spuriae of dithered 1kHz tone at 90dBFS with 24-bit data (left blue, right red) (20dB/vertical div.). 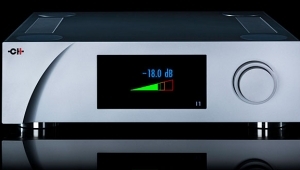 With undithered data at exactly 90.31dBFS, the Arcam output a symmetrical waveform with the three voltage levels clearly visible (fig.15). However, note the time discrepancy between the left and right channels, equivalent to a phase shift of around 120°not totally out of phase, but still enough to be of concern. Alarmed by this, I used the onscreen display to perform a full factory reset, to ensure that all the DSP was zeroed out, but the phase discrepancy between the two channels persisted (fig.16) with both USB and S/PDIF data. Fig.15 Arcam SR250, S/PDIF data, waveform of undithered 1kHz sinewave at 90.31dBFS, 16-bit data (left channel blue, right red). Fig.16 Arcam SR250, USB data, waveform of 1kHz sinewave at 0dBFS, 24-bit data (left channel blue, right red). 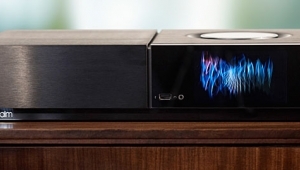 Finally, I tested the Arcam's S/PDIF inputs for their rejection of word-clock jitter. The results are shown in fig.17the odd-order harmonics of the LSB-level, low-frequency squarewave are obscured by the noise floor. (What would have been their correct levels are shown by the sloping green line.) However, sidebands of unknown origin are present at ±240Hz and its odd-order harmonics, and these persisted with 24-bit S/PDIF data. When I tested for jitter rejection with USB-sourced data (not shown), the spectrum was obscured by the same sort of spuriae seen in fig.11. Fig.17 Arcam SR250, high-resolution jitter spectrum of analog output signal, 11.025kHz at 6dBFS, sampled at 44.1kHz with LSB toggled at 229Hz: 16-bit TosLink data (left channel blue, right red). Center frequency of trace, 11.025kHz; frequency range, ±3.5kHz. Footnote 1: My thanks to Jürgen Reis, of MBL, for suggesting this test to me.